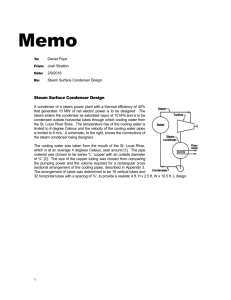 condenses by rejecting heat to an external fluid, which acts as a heat sink. drops from T3 to T4. can be further classified into natural convection type or forced convection type. systems. These condensers are sometimes called as flat back condensers. the effect of fouling by dust and to allow air to flow freely with little resistance. way that air can flow freely over the condenser surface. compact and have smaller weight. 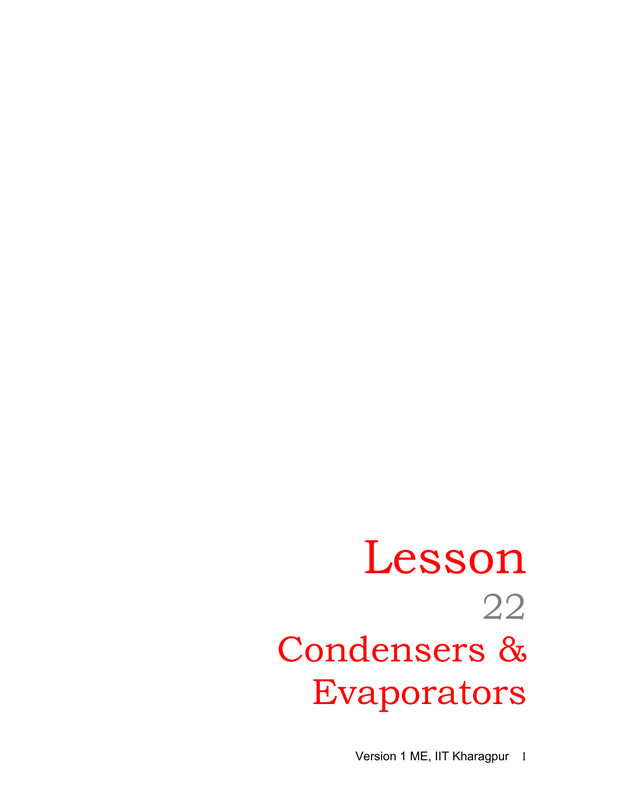 the ends to make the length of the condenser small and reduce pressure drop. poor liquid refrigerant drainage if the tubes are long. 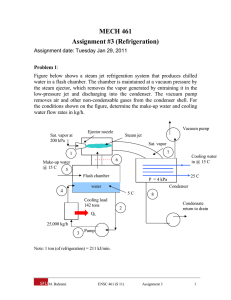 condensers, refrigerant flows through coils while water flows through the shell. the coils, cleaning is done by circulating suitable chemicals through the coils. tower. The role of air is primarily to increase the rate of evaporation of water. Evaporative condensers are used in medium to large capacity systems. 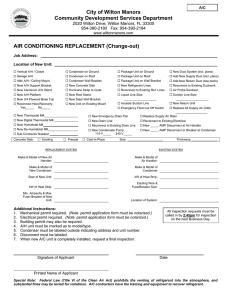 due to external air circulation etc. is shortage of fresh water these are used up to 100 TR or more. cannot be thrown back in warm state since it affects the marine life adversely. problem in use of water. 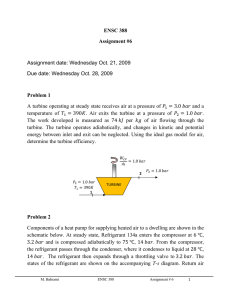 is to find the rate of heat transfer when other parameters are fixed. compressor in hermetic systems. These characteristics are shown in Fig.22.8. rejection can be determined for given Te, Tc and TR. evaluate the area required for each region, and finally find the total area. 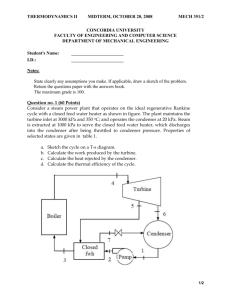 external fluid, and Tc is the condensing temperature. are the inner and outer radii of the tube, respectively. 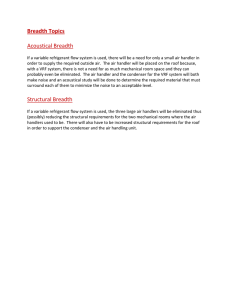 outside surface area the overall heat transfer coefficient can be increased. expressions and charts for the efficiency of annular fin have been obtained. row and C units between rows. Then the area of the fin is given by (B x C - πr12). radius of r2 ( = √( B x C/π)). with tubes and fins. The air flows through the passages formed by the fins. The heat transfer takes place from the fins and the exposed part of the tube. These areas are expressed in terms per m2 of face area and per row. good fit to their data for various geometries. diameter defined earlier in Eqn.(22.16). transfer rates, the thickness of the liquid film should be kept as small as possible. average number of tubes per column. thereby causing an increase in heat transfer coefficient. bottom and hence a smaller heat transfer coefficient. very conservative estimate of condensation heat transfer coefficient. 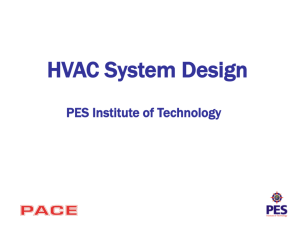 flow rate of vapour considerable influences the heat transfer coefficient. tubes particularly if the vapour Reynolds number Reg = 4 m /(πμg Di) < 35000. 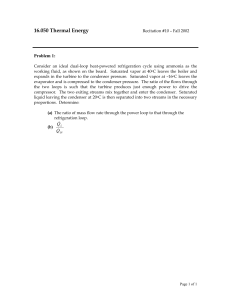 Reynolds number if all the refrigerant flows in liquid phase. correlation for turbulent heat transfer in tubes, except the constant is different. difference and it increases with the increase in liquid Reynolds number, Ref. Sometimes, it overestimates the heat transfer coefficient. The condenser tubes are clean when it is assembled with new tubes. 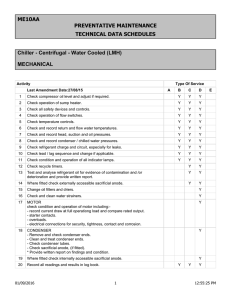 temperature difference between cold water and refrigerant to increase. the least over the running life of the system. 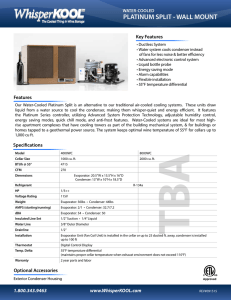 what will be the new average condensing heat transfer coefficient? where N is the number of tubes in a vertical row. condensing temperature? Take the specific heat of water as 4.18kJ/kg.K. inner diameters are 14.0 and 16.0 mm respectively. necessary to repeat the calculations. correlations are used for hi.